This article describes items that were to be sold at an auction shortly after its original publication, noting which items are rare and where they were found. It originally appeared in the April 1941 issue of American Collector magazine, a publication which ran from 1933-1948 and served antique collectors and dealers. 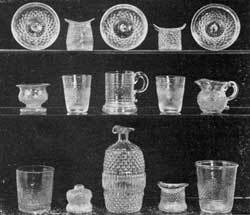 The American glass collection formed by the late William T. H. Howe of Cincinnati must be counted among the most outstanding in general interest of any ever assembled in this country. When Part I of this collection was dispersed last November, it was an event of national importance for glass collectors. The leading collections, both private and those in museums, were represented at the two sessions of this sale. Illustration I: Well-Established Sandwich Patterns: All blown three-mold glass, in colors. The footed pitcher is in cobalt blue, as are the hat and the two salt dishes in the upper row. The salt dishes in the lower row are, left, deep amethyst; right, sapphire blue. Now, in Part II, the balance of the Howe collection will be sold on the afternoons of April 3 and 4, at the Parke-Bernet Galleries. Like that of Part I, the catalogue for Part II has been prepared under the guidance of George S. McKearin, who has also written the foreword. It is a rare opportunity for collectors to acquire pieces from such a noteworthy collection. In fact, in Part II of the Howe collection, the blown three-mold pieces are probably more outstanding than any other type — aside from the Stiegel toilet bottles. Undoubtedly the one item which will be the highlight of the sale and excite the most interest will be the amethyst sugar bowl. The pattern itself is not unusual. The most common design in blown three-mold consists of a band of diamond quilting between two bands of vertical ribbing. In this case, the color and perfection of the piece determine the value. Illustration II: Rarities in Blown-Molded Glass: Outstanding are the three small sauce plates in the top row; the two miniature flip glasses and the mug with handle in the center row; and two tumblers and the ink well in the bottom row. Not over a half-dozen amethyst blown three-mold sugar bowls have been found to date. Curiously enough, these amethyst bowls have all been discovered in the Midwest and, therefore, have been attributed to some early Midwestern factory. However, it has been definitely established that the Boston & Sandwich Glass Company produced much three-mold glass in color, including sapphire blue and amethyst. While locality findings have often proved a valuable guide, still, such evidence cannot be considered infallible. Interesting examples of colored blown three-mold patterns which can be definitely attributed to Sandwich are those shown in Illustration I. The pitcher is a type which may have been produced elsewhere, though many fragments of simple, paneled designs have been excavated at the site of the Cape factory. This one is rare because it is footed. Also in this illustration are four salt dishes, three of which have sunbursts, alternating with diamond quilting. These are all in deep sapphire blue except the one to the left of the pitcher, which is a deep amethyst. The hat is in the popular diamond sunburst pattern and is rare in blue. Exceedingly Rare Lamp: The pear-shaped bowl is blown molded in diamond diapering and vertical ribbing pattern. It is mounted by an ornamental brass ferule on a pressed glass base that is lime green in color. Illustration II depicts a six-and-a-quarter-inch dish in the same diamond sunburst design. The handled mug next to it has the rather scarce waffle sunburst pattern. The sugar bowl in this group is a particularly fine impression. All covered, blown three-mold sugar bowls that are in perfect condition are rare. The cream pitcher next to the bowl is in a particularly rare pattern, showing a sunburst with bull’s-eye center. Another outstanding rarity in blown three-mold is a pear-shaped lamp bowl, as shown in Illustration III. The standard is of green glass, the blown bowl and pressed base being connected by a brass fitting. Such a lamp could have been produced by the Boston & Sandwich Glass Company from 1828 to 1838. It might have been made later, of course, but this is doubtful, since pressed glass was rapidly crowding out the earlier blown styles. At the time pear-shaped lamp bowls were in vogue, whale oil and other such burning fluids were still being utilized. In Illustration IV, many unusual pieces are shown which would enhance any collection. Outstanding are the small sauce plates in the top row. Any blown three-mold dishes in a three-and-three-eighths-inch size are scarce. The miniature flip glasses in the center row, three inches high, are also rare. The handled mug, pictured between the flips, is a most uncommon type. In the bottom row, the two tumblers are both choice. The one at the left is unusual in the diamond sunburst pattern. 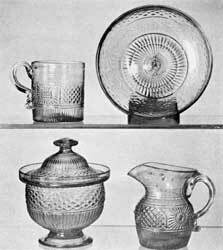 The jelly tumbler (or toddy glass) at the right is seldom found with a folded rim. The little inkwell is also a rarity. Choice Blown Molded Glass: In the upper row are a handled mug with the scarce waffle sunburst pattern and dish in the diamond sunburst design. Below are, left, sugar bowl with cover in perfect condition and, right, a cream pitcher of the rare sunburst with bulls-eye center pattern. Space does not permit descriptions or even mention of all the outstanding pieces which will be sold in Part II of the Howe collection sale. 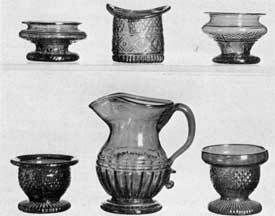 There are important Stiegel pieces and Midwestern specimens of the Stiegel types, including a sugar bowl and cream pitcher in the expanded diamond pattern; an extremely rare emerald-green salt shaker; Stiegel toilet bottles in the Diamond Daisy, as well as expanded diamond patterns; an important dark amber sugar bowl with superimposed decoration; a New York State lily-pad pitcher; and many superb Midwestern pieces, as well as choice historical flasks. There are no pressed Lacy dishes of great importance. Mr. Howe, being a discriminating collector, included pressed glass, but the best of it was sold in Part I of his collection last November. Included this time are two pieces having historical significance, the first being an octagonal six-inch plate with an old side-wheel steamer, thought to be the Fulton, which is scarce but not an extreme rarity, and a small oval Sandwich dish having alternate medallions showing an eagle in one and a small ship in the other. I have a miniature (approx. 1″ tall) glass carousel horse. The glass is a transparent light purple and is molded verses hand-blown. I haven’t been able to find any information on what it was used for or the year it was produced. Do you have any information? I have an assembly,collected over a span exceeding fifty years,of Galloway pattern. I cannot discern the nomenclature of what some of the pieces are. What Makes Cartoonist Roz Chast Laugh? “ ” When women in the suffrage movement wanted to provide evidence of their intelligence, they highlighted the smart ways they were operating their homes. But black women had been doing all the work.